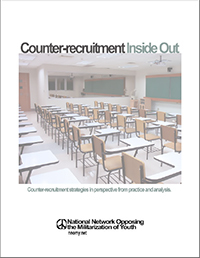 Counter-recruitment Inside Out, is a compilation of articles authored during the last 12 years by activists and researchers, offering an analysis of counter-recruitment practices. It also seeks strategies for improving its effectiveness in persuading the youth to take a harder look at military enlistment, and to develop a more informed view of the motivations behind their government's wars. With the advent of militarized gaming and the increase of movie and television militainment influencing young minds and legitimizing state violence, counter-recruiters need to develop more nuanced methods of directing young people towards alternatives to militarization.